In today’s competitive commercial landscape, successful businesses are searching for innovative ways to improve productivity and streamline processes. Being lean and efficient can have great impact on the bottom line and is critical to the success of your organization. As an enabler for dynamic business synergy, Canon MDS (Managed Document Services) helps you manage your print and documents effectively and holistically – working smarter by unifying people, process and technology. In short, it's a way of re-focusing attention on your core business. Leaving print related activities in the hands of Canon, your trusted experts. With Canon MDS, the solution is simple. In a complex business world where everything seems urgent and necessary, it takes an expert eye and experience to cut through the clutter to create simplicity and synergy. Canon MDS adopts a consultative approach to help you optimize your print devices and information workflow. Our deep dive analysis identifies areas of wastage and redundancies. Coupled with the understanding of your business condition and objectives, we formulate a print and document strategy to help you bridge the gap between your business direction and the supporting infrastructure – driving your business forward, while ensuring efficiency, security and visibility. Redundancies and hidden costs can impact business profitability. We help identify and eliminate such areas and innovate new ways to help you save costs. Factoring in human intuition, business efficiency and resource usage, we deliver a print and document workflow that achieves results. Canon MDS ensures that each device in your entire printer fleet sees well-suited usage, in line with the user, departmental or organisational needs of your business. With active management and consultation, Canon MDS takes a pro-active stance to maintain your printer fleet to ensure maximum device availability, leaving you to concentrate on your core business. Spending time to understand your business needs and requirements is a crucial part of Canon's MDS offering. Canon MDS provides a single point of contact for your print and document management needs. 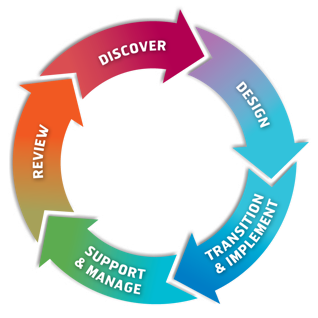 Working through a 5-phase cycle using proven project delivery and management methodologies, you can be sure of the functional and commercial benefits expected. To that end, we work to ensure that all these are delivered ― or exceeded. Our consultant will conduct an audit to understand your current print fleet and print behaviour, while capturing project requirements and determining the total cost of ownership of the current state. We will provide an insight into your current print environment and help you identify areas that you can better manage or save cost. Based on the result of the audit, Canon will design a solution that optimises your print and document workflow. We work with you to define the business case, propose optimal solution and services, and achieve the desired savings. Canon helps manage the entire implementation process to ensure a seamless transition into the new managed solution. Through effective communication and training programs, we minimise the impact on your end-users, and promote smooth migration to the new solution, to realise the full benefits of the program. We ensure that your print and document environment sustains peak performance over time and that service level expectations are met, maintaining high level of user satisfaction. The improvement process does not end here. Using actual service performance information, we strive to deliver continual improvements, supporting your evolving business needs and addressing greater commercial and operational efficiency.